WACO, Texas (Sept. 20, 2018) – For nearly 100 years, Baptist Student Ministries has worked to equip college students across the country to follow Christ and transform the world. 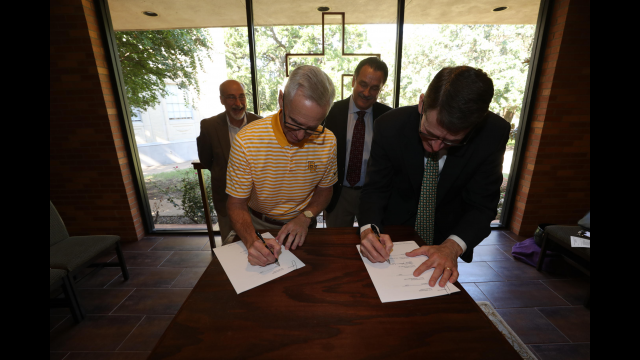 On Wednesday, Baylor University and the Baptist General Convention of Texas signed a cooperative agreement for a renewed vision of Baptist Student Ministries (BSM) as a chartered student organization on campus. 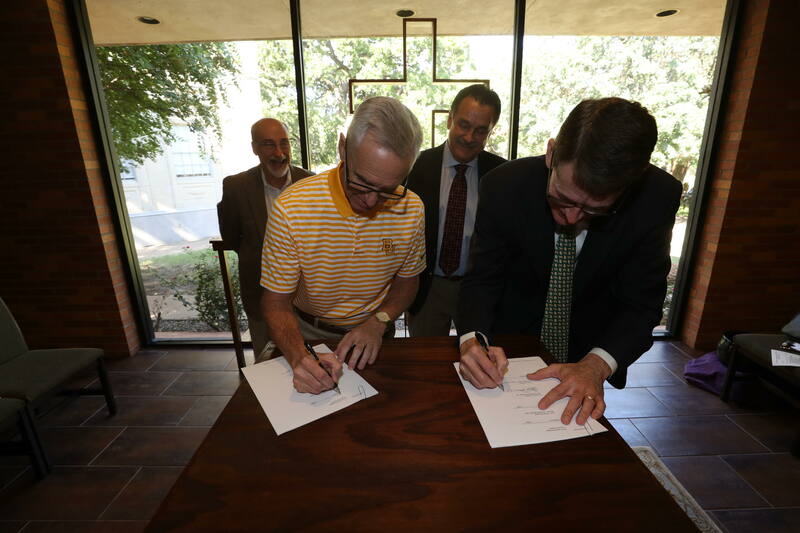 After reading Scripture from Psalm 133 – “How good and pleasant it is when God’s people live together in unity!” – Baylor representatives Kevin P. Jackson, Ph.D., vice president for student life, and Burt L. Burleson, D.Min., University chaplain and dean of spiritual life and missions, joined BGCT Executive Director David Hardage, D.Min., and Collegiate Ministry Team Director Bruce McGowan at the Bobo Spiritual Life Center to sign and offer prayer over the agreement. Baylor BSM has offices in the Bobo and its students meet there for most BSM activities. In the last two decades, Baptist Student Ministries at Baylor and other Baptist universities in Texas served students through a more integrated model at their universities. At Baylor, BSM was related to and considered as a department in Student Life, which led to some important ministry on campus, Burleson said. 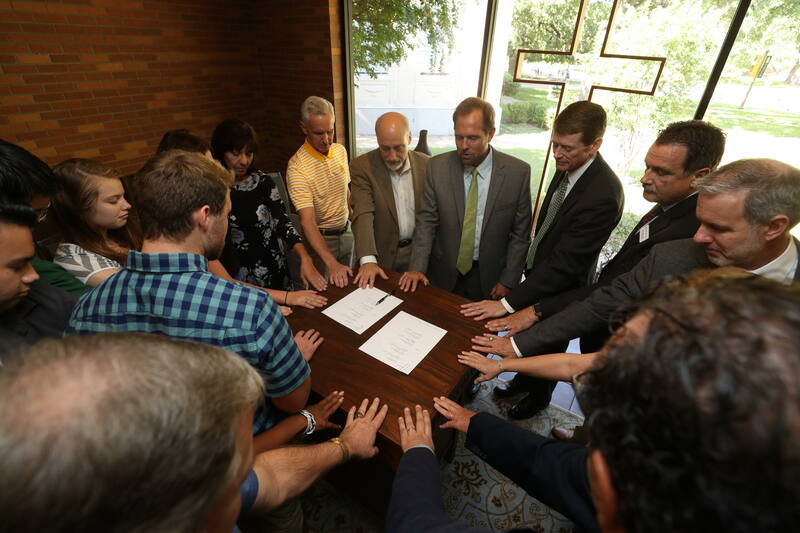 Recently, BSM and BGCT leadership and Baylor discerned it was time to move to a more traditional campus ministry model that is centered in a chartered student religious organization. Baptist Student Ministries is a cooperative ministry of Texas Baptist churches that encourages students to follow Christ and transform the world. On 110 campuses across Texas, BSM is a student-led organization that provides opportunities for spiritual growth, making friends, leadership, service and missions. BSM includes big events with hundreds of people to small groups and one-on-one mentoring, so students can find a place that is right for them. At Baylor, BSM’s mission is to equip Christian men and women for worldwide leadership and service by integrating catalytic discipleship and vocational excellence within a dynamic community. BSM engages Baylor students during its regular Thursday night meetings at the Bobo Spiritual Life Center, as well as additional opportunities throughout the week for prayer, Bible study and missions. 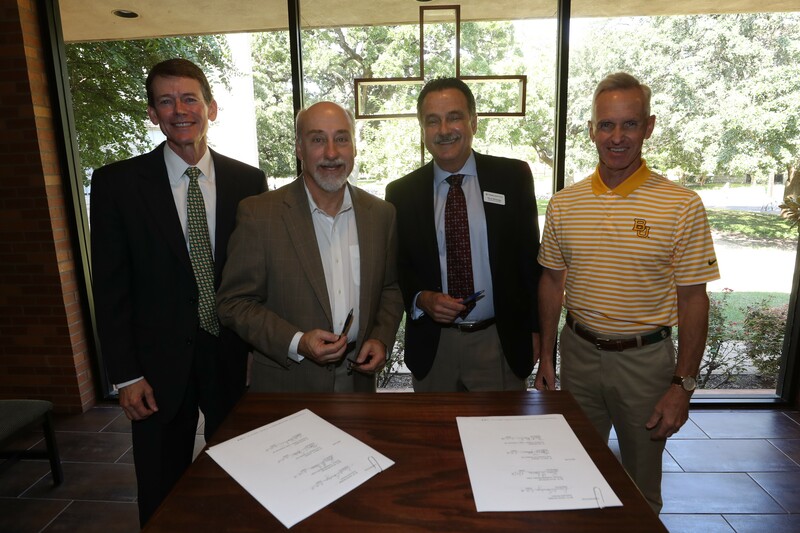 “BSM has a special place in the history and character of Baylor University, and the agreement signed today marks the beginning of a new chapter in our shared ministry,” said Charles Ramsey, B.A. (University Scholar) ’97, M.A. (Religion) ’00, Ph.D., director of BSM at Baylor. “It is a timely recommitment to the centrality of the Gospel in the founding vision of the University, and an affirmation of our joint mission to equip Christian men and women for worldwide leadership and service. 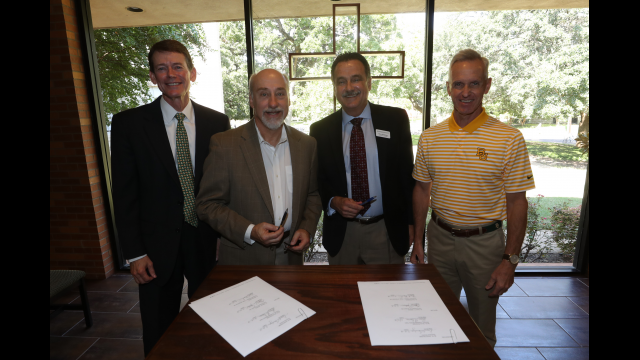 It signifies that Baylor has strong ties to its Baptist heritage, and that BSM will continue to take a central role in strengthening this partnership by equipping students to make a difference in the lives of those they will lead and serve,” he said. For almost a century, BSM – or as it was known in its earlier existence as Baptist Student Union or BSU – has played a significant role in the spiritual formation of Baylor students. It has served as a foundational experience for students as they lived their life based on God’s plans and purposes, not their own, Jackson said. The foundation for a national vision of campus ministry that eventually became Baptist Student Union was laid at Baylor on Oct. 21, 1905, when six students formed a prayer covenant after attending a student YMCA meeting. Fifteen years later, Joseph P. Boone, one of the participants at that meeting, became the first full-time Baptist student worker in the South as Baptist Student Secretary of the BGCT, according to Baptist historian H. Leon McBeth. 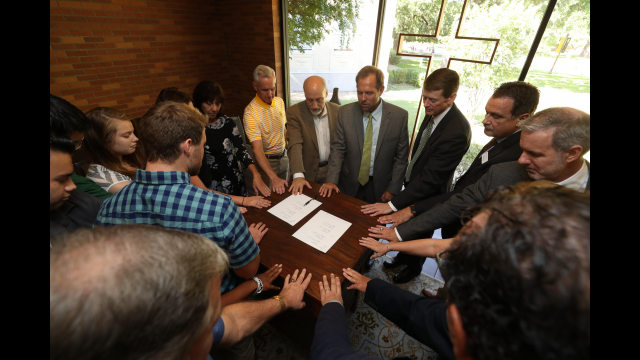 In addition, many of the activities and traditions found at Baylor today find their roots with the BSU, including Welcome Week, which started in 1979 as a ministry of the BSU, the Baylor Religious Hour choir, Missions Emphasis Week and Spring Revival Week. For more information about BSM at Baylor, visit www.baylor.edu/spirituallife or find them on Facebook at www.facebook.com/BaylorBSM.